On October 29, 2015, we will mark the third anniversary of Superstorm Sandy wreaking havoc along the coastlines of New York, Connecticut and New Jersey. Credited as the second costliest hurricane since 1990, Sandy damaged or destroyed more than 653,000 homes in the tri-state area. Over the next week, the New York Annual Conference will offer a look at how the storm and recovery has affected homeowners, volunteers and those involved in coordinating the rebuilding efforts in New York and Connecticut. We hope that these “voices of recovery” will inform you about what has been accomplished through our donations and volunteer efforts, but more importantly about the work that remains to be done – three years later. We also hope that these stories, photos and videos will prompt you to volunteer for the very first time – or to return again – so that those who are still waiting may return home safely. Bishop Jane Allen Middleton, the interim episcopal leader of the New York area, has challenged our six districts and their churches to be more engaged in these recovery efforts to bring an end to the heartbreak. In tomorrow’s (October 27) blog, you’ll find a short video to download for use in your churches, meetings and worship to once again rally people around this cause. We can shine the light of hope in places where it has all but disappeared! To volunteer for, or donate to, the recovery effort, go to: www.nyac.com/recovery. Our sincere gratitude goes to Rev. Arthur McClanahan, former member of the NYAC and now director of communications for the Iowa Conference, who freely offered his gifts as a storyteller and videographer to this series. In October of 2012, Dawn Hughes was enjoying her home again after renovations had been made to repair damage from Hurricane Irene in 2011. Her home sits just a few houses north of the Great South Bay in Lindenhurst, N.Y. One of the many canals cutting into the coastal landscape lies just 15 feet out her back door. But Hughes’ sense of peace would not last long. On October 29, Superstorm Sandy made landfall in New Jersey, and barreled its way across coastal New York and Connecticut. The accompanying floodwaters inundated Hughes’ home and hundreds of thousands of others in the tri-state area. “Everything was destroyed in six feet of water,” she said. “I lost everything.” Hughes had gone through her savings to make the Irene repairs and relied on the help of family and friends to gut her first floor after Sandy. But today, Hughes has her whole house back again thanks to 10 volunteer work teams sent out by the Long Island Sandy Recovery Ministry of the New York Annual Conference. 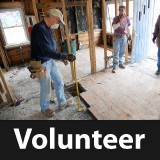 Some 120 people put in 655 volunteer hours installing subfloors, insulation and drywall so that heat and electricity could be restored to the first floor. “Every one helped, some skilled, some still learning,” she said. “Every single hand was helpful, everybody makes an impact. Hughes took photos of every team, but remembers two of the groups especially. Hughes’ gratitude is palpable as she talks about what a difference the outpouring of help has made in her life. Hughes is concerned about those who are still unable to return to their homes. Long Island Sandy Recovery Site Coordinator Peggy Racine shares her thoughts on the recovery efforts. Coming tomorrow: Connecticut coordinator Susan Shaw, a work team from Vermont, and Rev. Wendy Vencuss on pastoral care in a disaster.